The new Bond film, "Quantum of Solace", hit the theaters this weekend. Looking forward to catching it soon. I've been anticipating this one. Think I'll go see it. Besides, I'm running out of make believe scenarios to get Flinchy out of all that trouble that you guys (John and GF) keep getting him into. Maybe I'll learn something. Ha ha! 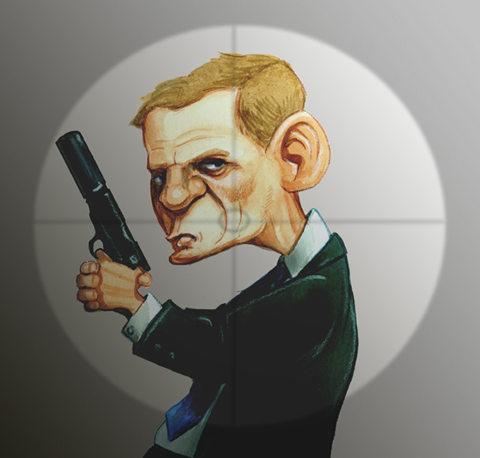 Excellent, spot-on Daniel Craig / James Bond rendering. He's made the Bond movies worth looking forward to again. Yeah, well, according to Mark Steyn, when asked in in a recent interview as to who would make a better Bond, Daniel Craig chose Barack Obama over John McCain (he said McCain would probably make a great "M"). Go figure, said Steyn, Craig chose a lawyer and "community organizer" to be the daring man-of-action" over a war veteran and former POW WHO ACTUALLY FLEW JETS IN ACTION, WAS SHOT DOWN AND TORTURED. Daniel Craig - another cardboard action hero who's a mindless libtard at heart. John should put a rubber suction dart in the muzzle of that pistol. Yeah, well, according to Mark Steyn, when asked in in a recent interview as to who would make a better Bond, Daniel Craig chose Barack Obama over John McCain (he said McCain would probably make a great "M"). Go figure, said Steyn, Craig chose a lawyer and "community organizer" to be the daring "man-of-action" over a war veteran and former POW WHO ACTUALLY FLEW JETS IN ACTION, WAS SHOT DOWN AND TORTURED. Daniel Craig - another cardboard action hero who's a mindless libtard at heart. John should put a rubber suction dart in the muzzle of that pistol. This page contains a single entry from the blog posted on November 14, 2008 6:41 PM.